Chop short/spread long at the touch of a button, processing to a precise and consistent length. 64,500 chops/minute for a fine and consistent output. Process up to 6 tonnes/hour at a chop length of 5cm. In-line high pressure filter stops contamination from damaging the valve equipment. Increase capacity and ease of loading, attaches easily to a standard tailgate. Essential for highway use, the front and rear markers ensure that you operate safely when travelling on the road. Where no pick up hitch is available a clevis drawbar and jack is available for straight forward hitching and unhitching. When using the 7100 with smaller tractors a drawbar and axle kit can be fitted. This makes hitching and unhitching easier, but makes the machine harder to reverse in narrow aisles. When mounted on smaller tractors, the stability of the mounted 7100 and 7150 models can be improved by fitting an optional castor wheel kit. For continuous operation when turning corners a Wide Angle Walterscheid PTO shaft is also available. 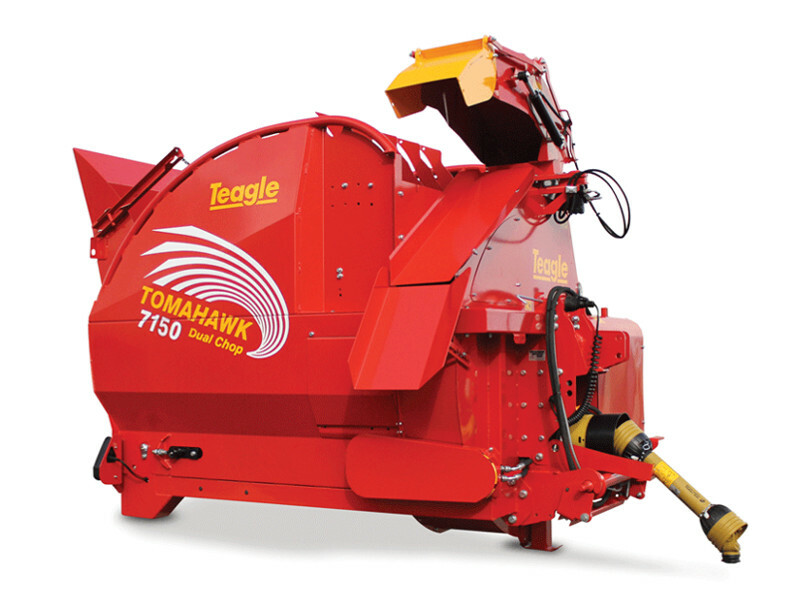 Teagle make the widest range of Bale Processors available from any manufacturer, from pre-processing straw to delivering clamp silage we have a model to suit your needs.